This is the Watermill by Element Four. Element Four is a British Columbia-based company that's determined to solve the world's potable water problems and their first product in that direction is their Water Mill. 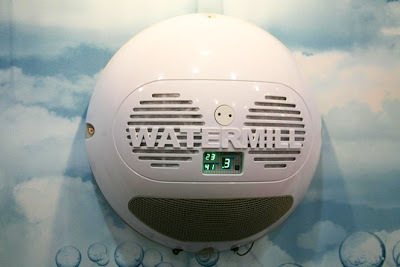 The Water Mill mounts to the exterior of your home and distills pure water from the air. It's estimated to cost 35 cents a day to run and it cranks out 3.2 gallons of water a day. 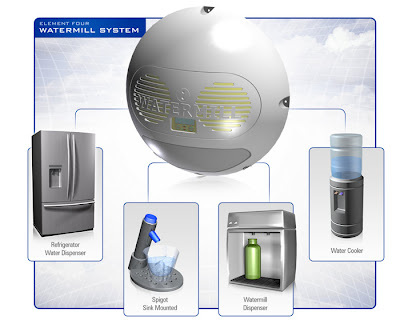 The Water Mill can be connected to a sink top dispenser, the ice and water dispensers on a fridge, its own wall-mounted dispenser or it can run into a separate, refrigerated appliance dispenser. The diagram below shows these four dispensing options pretty well. While the Water Mill can't supply all of a household's water needs, it can provide ample drinking water for a family or individual and it will help you throw away the bottle for once and for all. Well since it mounts to the exterior of a house, it's a great opportunity for seasonal decoration. Think about it, a jack 'o lantern for Halloween, Frosty the Snowman for Christmas, the Easter Bunny in the spring. Imagine the possibilities!